American artist Chelsea Gibson's oil paintings are on exhibit at 527 Madison Avenue's lobby gallery through April 27, 2018. Mitsui Fudosan America's lobby gallery at 527 Madison Avenue will showcase six oil paintings by Chelsea Gibson from January 11 to April 27, 2018. Located at 54th Street and Madison Avenue, the exhibition is open to the public from 9 a.m. to 5 p.m., Monday to Friday. The six multi-panel paintings on display depict these domestic spaces and the people who live in them. Filled with furniture, books, dishes, plants and rugs, these compositions not only show the individual but also celebrate the objects that transform their house into a home. The paintings, crafted on shaped wood panels, use bright colors, strong lighting and intricate detail to bring the interiors and their subjects to life. Born in 1983, Chelsea Gibson grew up in Western Massachusetts. 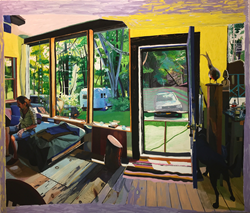 She received a Bachelor of Fine Arts in painting in 2006 from the Rhode Island School of Design and a Master of Fine Arts in painting in 2010 from Boston University. She currently resides in Gilbertsville, New York, a small town in the Catskill Mountains. The is the 12th exhibition on view as part of 527 Madison Avenue's ongoing program displaying noteworthy emerging and mid-career artists. Mr. Purcell collaborates with art consultant Jay Grimm; the property's leasing agents, James Frederick and Peter Occhi; and property manager, David O'Donnell on the selections for the rotating gallery. 527 Madison Avenue, located at the corner of 54th Street in New York City, is a boutique commercial office building designed by celebrated architectural firm FXFOWLE. Completed in 1986, it is owned by an affiliate of Mitsui Fudosan America, Inc., which recently invested in significant upgrades including elevator modernization and a new MdeAS-designed lobby. About Mitsui Fudosan America, Inc.
Mitsui Fudosan America, Inc. (MFA) is a real estate investment and development company headquartered in New York City and is the U.S. subsidiary of Mitsui Fudosan Co., Ltd. – Japan’s largest publicly traded real estate company. MFA’s history in the United States dates back to the early 1970s. Since its inception, MFA has acquired and developed numerous office, multifamily and hospitality properties in major markets throughout the U.S. In addition to its significant portfolio of office buildings, MFA recently expanded its development platform, with several office and multifamily development projects launched in New York, Seattle, San Francisco, and Washington D.C.